The lack of detail and consistency in the description of the changes makes it difficult to assess exactly who the measures will apply to. 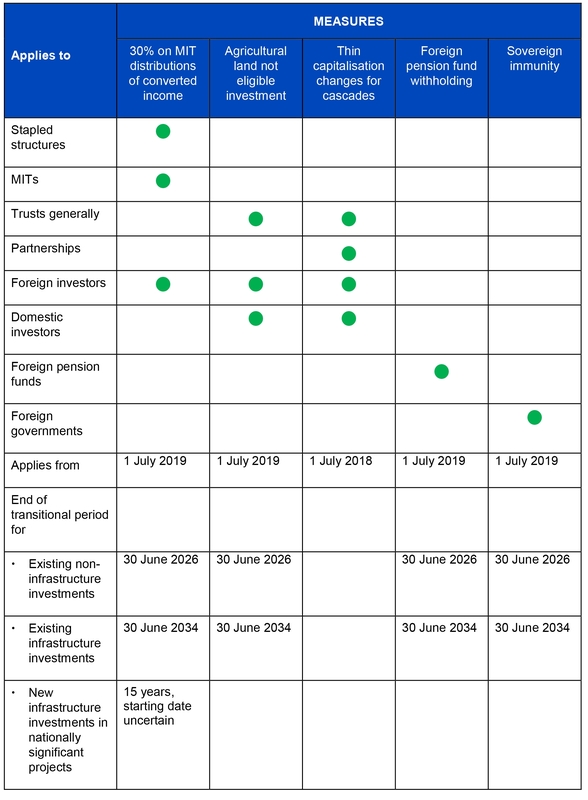 Investors with any interest in a trust and foreign pension funds and soverign wealth funds must keep a keen eye out for more details, some of which may well come in the upcoming Federal Budget. There has traditionally been an internationally recognised principle of sovereign immunity, that prevents one sovereign taxing another (kind of like the business world’s version of diplomatic immunity). The immunity is applied to passive and minority investments, but has never been legislated. Fund managers with a stapled structure already in place should have 7 years (or 15 years for an infrastructure fund) under the transitional rules do not need to take active steps to change the structures. Many funds will cease within these transitional periods. Those that remain in existence beyond those periods may simply choose to bear the additional tax for particular income and particular classes of investors. However, new funds should consider their use of MITs and staple structures. MITs will still likely be the fund vehicle of choice, as funds should generally not be worse off than other vehicle choices. However, the new law will limit the tax benefits of forming a staple vehicle for the pure sake of tax – a policy win for the Government.